I’ve been working with a number of area librarians to create maker and STEAM workshops for their libraries. In preparation for some more advanced workshops, I worked with Nina Taylor, the teen librarian at the Morse Institute Library in Natick, Mass. to put on a vibrobot workshop. The kids were great, and some immediately took to experimenting, decorating and creating wild things, while others needed getting used to the idea of doing something beyond following directions. Almost all of them said they would come back to do more, so I consider it a resounding success. 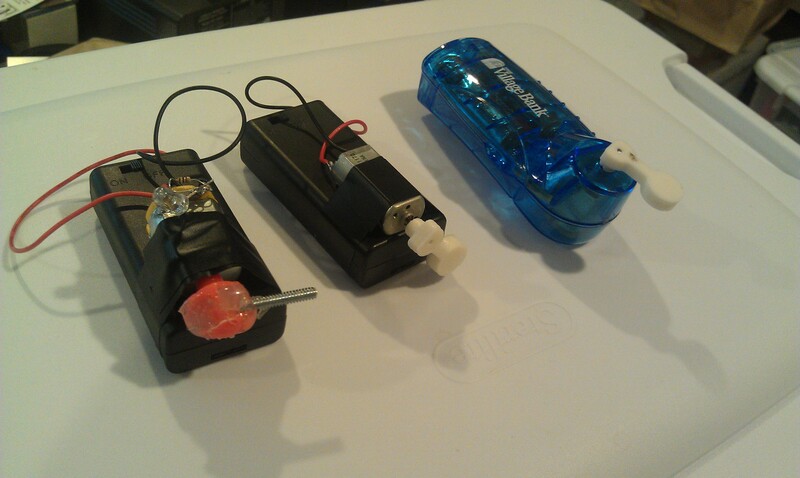 In addition to making Bristlebots (invented by Evil Mad Scientists) and sold as a kit by Makershed, we also made “drawbots” for which I made vibro-packs from salvaged motors and battery packs. The Makershed kit is great, in that wires are already attached to the batteries, making assembly very easy. For the drawbots, we taped markers around a cup as legs and then attached my vibro-packs. You can make any motor vibrate by attaching a weight off center to the shaft. 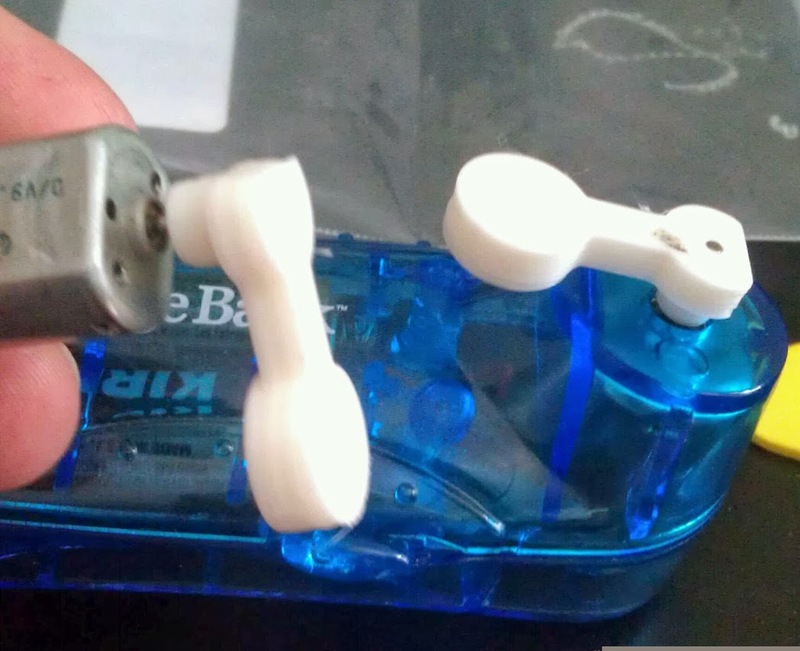 As you can see in this picture, I made one by taking the propeller off a bubble blower toy, and hot gluing a screw in. I created a very simple model in Open SCAD, that was adaptable to the various salvaged motors..
You can download the source here, or from Thingiverse. 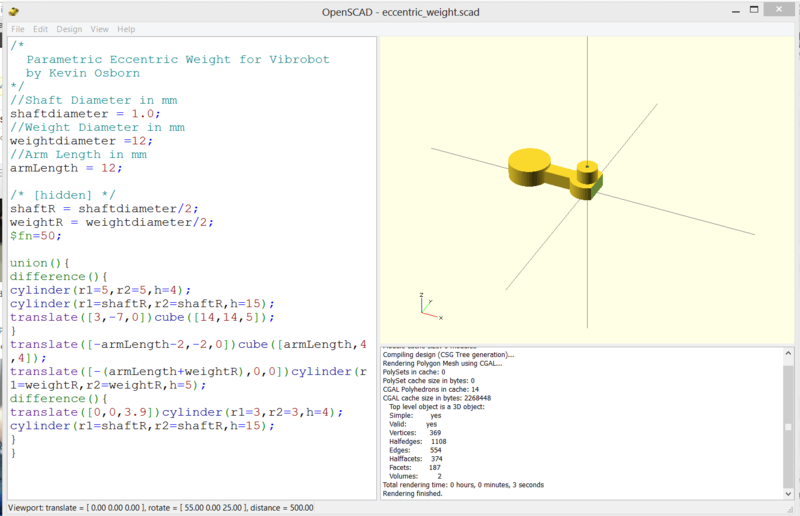 You can use the customizer widget on thingiverse, but it’s much faster if you have OpenScad installed and you tweak it yourself! I’m most proud of the the free fan (ok, I lost the fan part) from a local bank, but it makes a great, all in one battery pack, switch and motor! It’s a fantastic introduction to making, so try it yourself!